Colorful Stickers for Quick Assembly. Detailed Decals for Advanced Builders. 1:25th scale. IP. 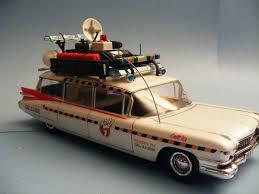 Model of the converted Cadillac Hearse ECTO-1 from the movie 'Ghostbusters'. Moulded in White/Chrome/Clear plastic it features a detailed equipment rack and an expanded decal sheet with options for ECTO-1 or ECTO-1A.